A hamster sits 0.10 m from the center of a lazy Susan of negligible mass. The wheel has an angular velocity of 1.0 rev/ s. How will the angular velocity of the lazy Susan change if the hamster walks to 0.30 m from the center of rotation? Assume zero friction and no external torque. It will speed up to 2.0 rev/s. It will speed up to 9.0 rev/s. It will slow to 0.01 rev/s. It will slow to 0.02 rev/s. (c), but see video for explanation. This is College Physics Answers with Shaun Dychko. A Lazy Susan is a circular shelf usually put in the corner of a kitchen. So we can think of it as a platform. We're told that it has negligible mass and so it has no effect on the moment of inertia of the system, so that's nice. Now, as this hamster changes their position, the moment of inertia of the system will change because the moment of inertia is due to the hamster. So the hamster's mass multiplied by its distance from the axis of rotation squared, is going to be the moment of inertia of the system. 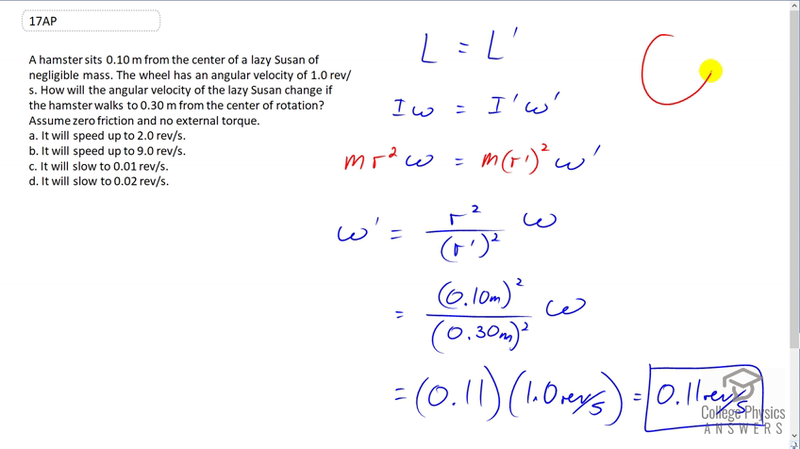 Now angular momentum is conserved and so we have moment of inertia multiplied by the initial angular velocity equals the moment of inertia after the hamster moves, multiplied by the angular velocity after the hamster moves. So we have m r squared omega equals m r prime squared omega prime. We can solve for omega prime by dividing both sides by m r prime squared. The m's cancel and we're left with omega prime equals r squared over i>r prime squared omega. So the initial radius for the hamster is 0.1 meters and we square that, and divide that by 0.3 meters squared and multiplied by the original angular velocity. I did this in two steps. So 0.1 divided by 0.3 is one third and you square that and you get one ninth which is 0.11, multiply that by one revolution per second and you get 0.11 revolutions per second. Now, none of the options that are shown here equal that and so what we have to do is just -- typos happen and we have to pick the best answer. What do we think is the one that they meant to write as 0.11 revolutions per second? It would seem to me that answer C is the least wrong answer of all these four. All four of them are wrong but C is the least wrong and so it's the best answer and so that's the one we choose even though it says 0.01 when it should say 0.11.